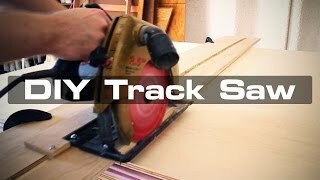 I took an old circular saw and turned it into a nice track saw with a bit of aluminum and some plywood. I also made some upgrades: https://youtu.be/qmlwNEKGR8E. ▶ The pink stuff underneath the plywood is insulation foam, available at any big box hardware store. It makes it a lot easier to cut sheet goods, eliminating the need to hang cutoffs over the end of the workbench. Make your own 5 minute saw guide. PERFECT CUTS!